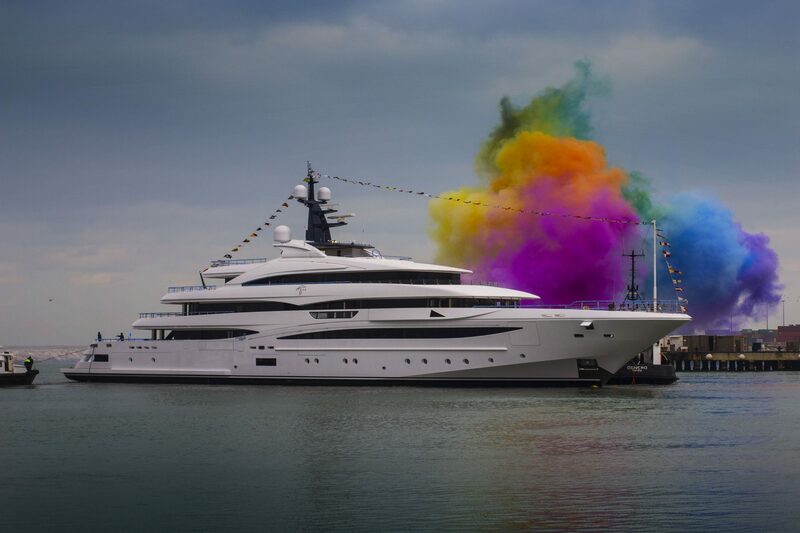 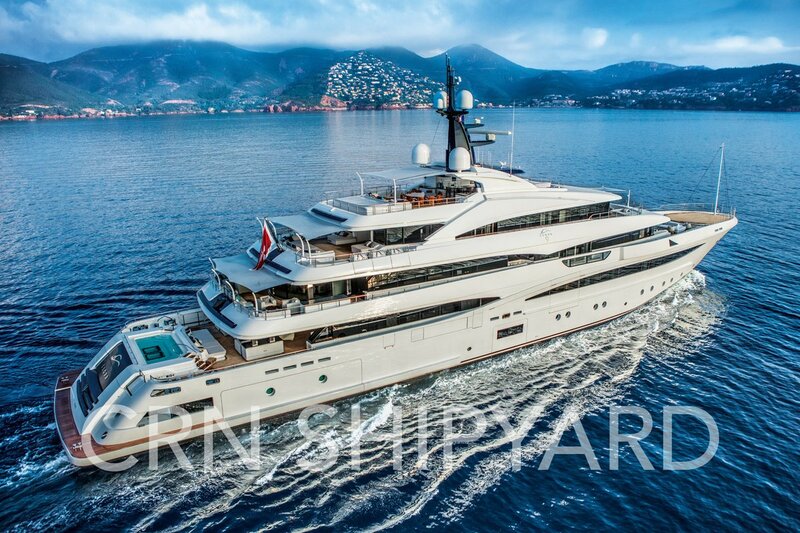 This 74-metre CRN mega yacht was launched 2017 and, just as other superb vessels from the same builder, is an example of an outstanding Italian design, exceptional craftsmanship and immaculate attention to detail while offering safety and comfort at the same time. 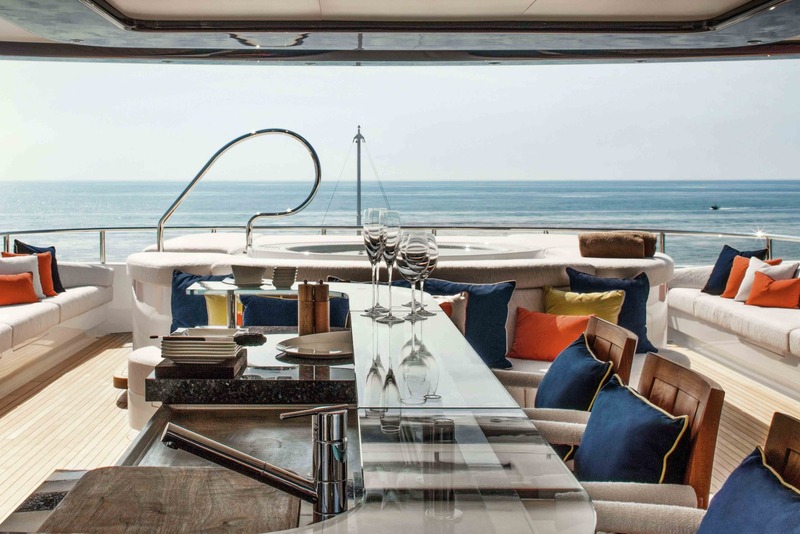 Thanks to her length and a large beam of 13,50 metres, spacious areas offer plenty of options for entertainment, socialising and relaxation. 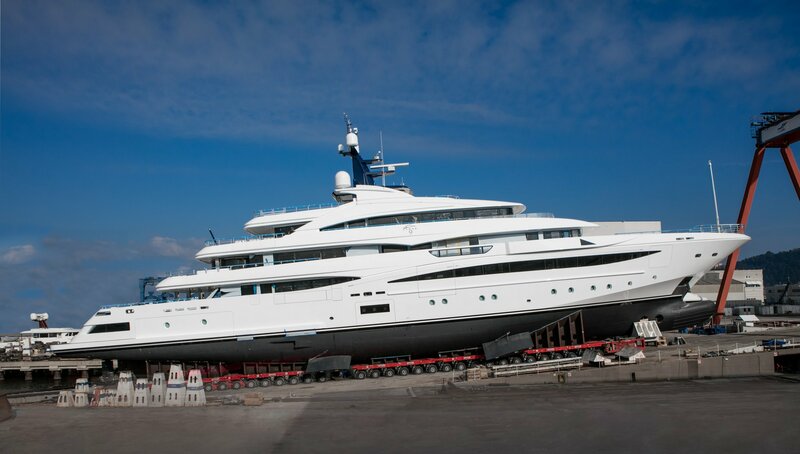 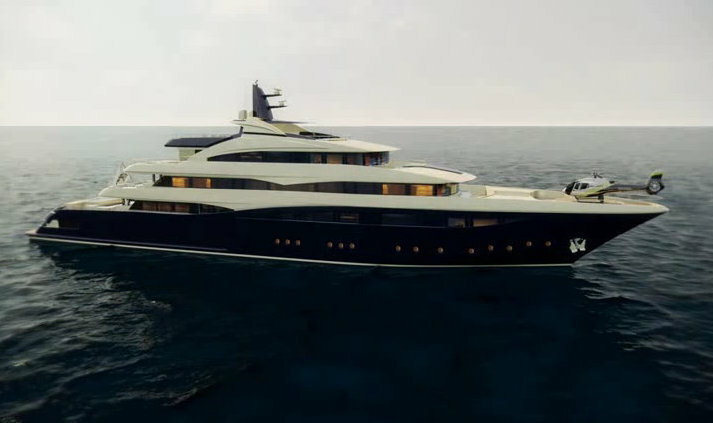 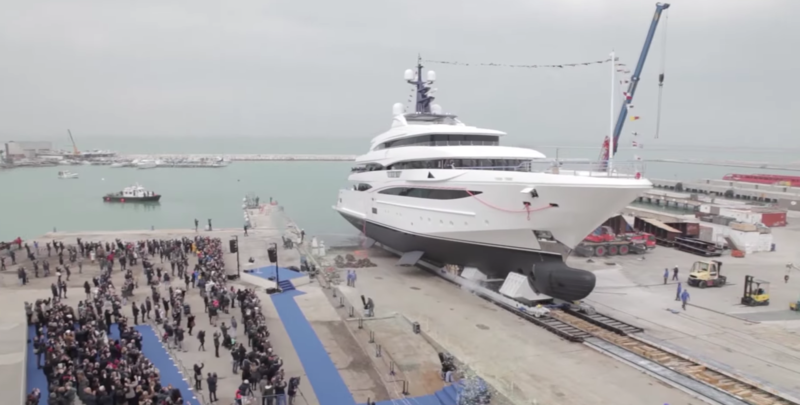 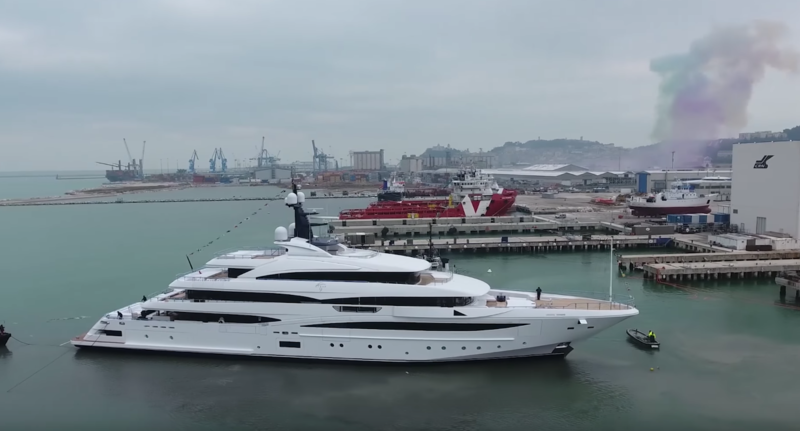 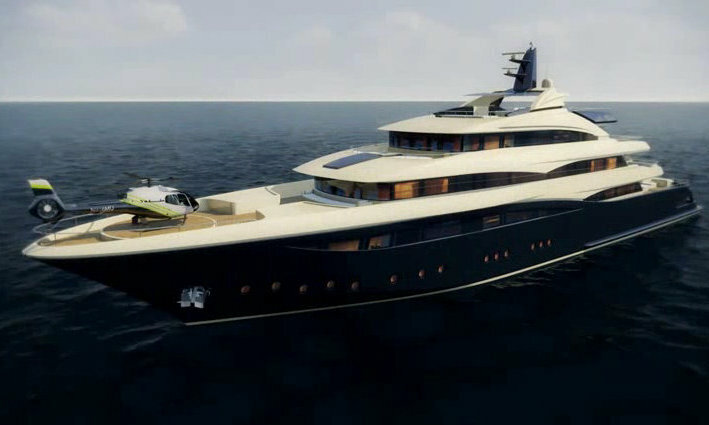 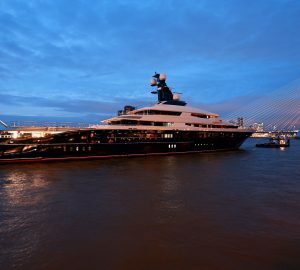 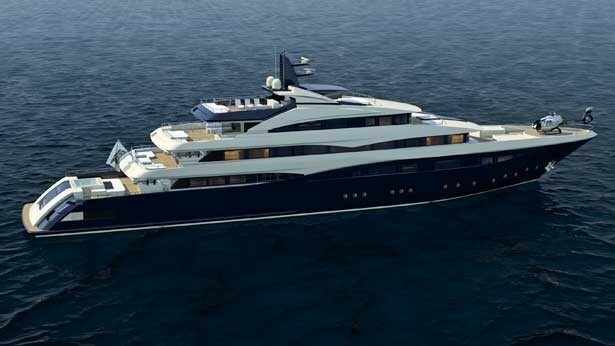 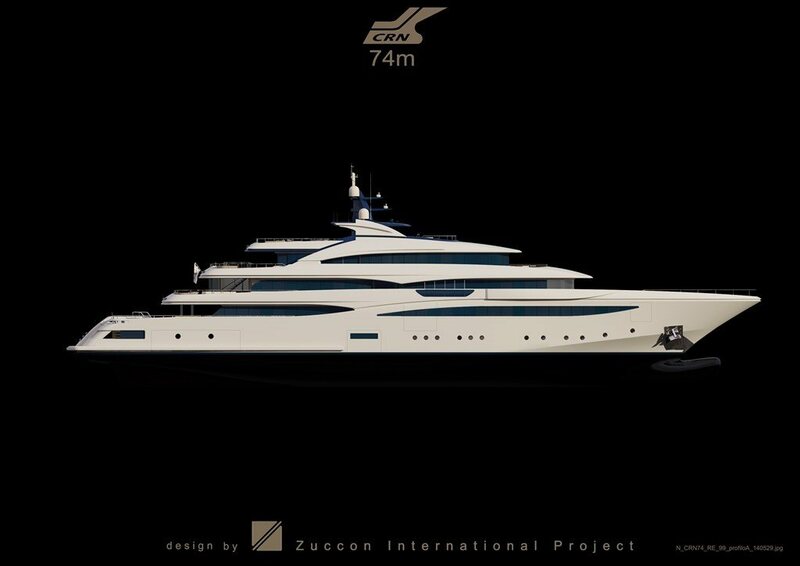 CRN Ancona and the Owners have chosen Zuccon International Project for the sleek and timeless and ground-braking exterior design while Winch Design for her interiors, where the designers were able to create a sophisticated yet relaxed and inviting atmosphere. 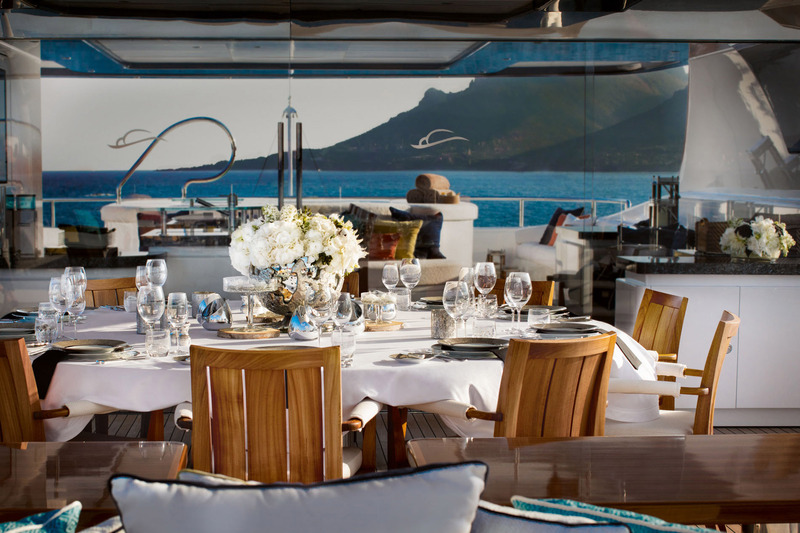 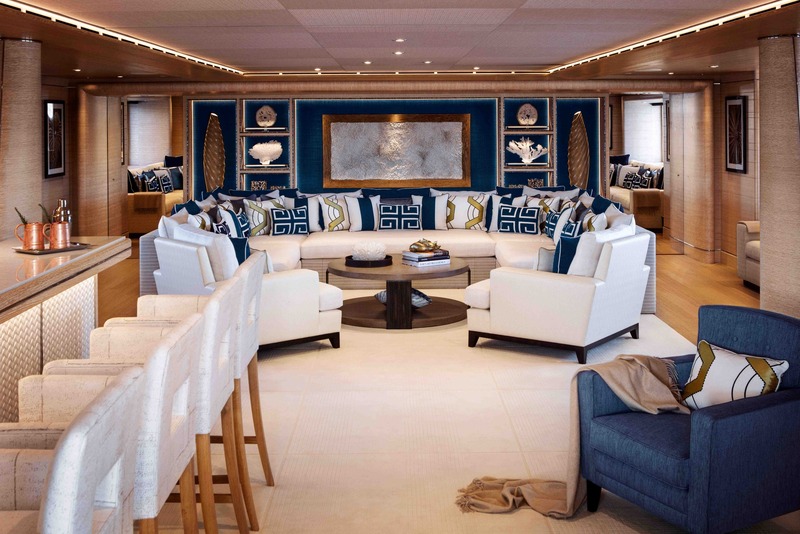 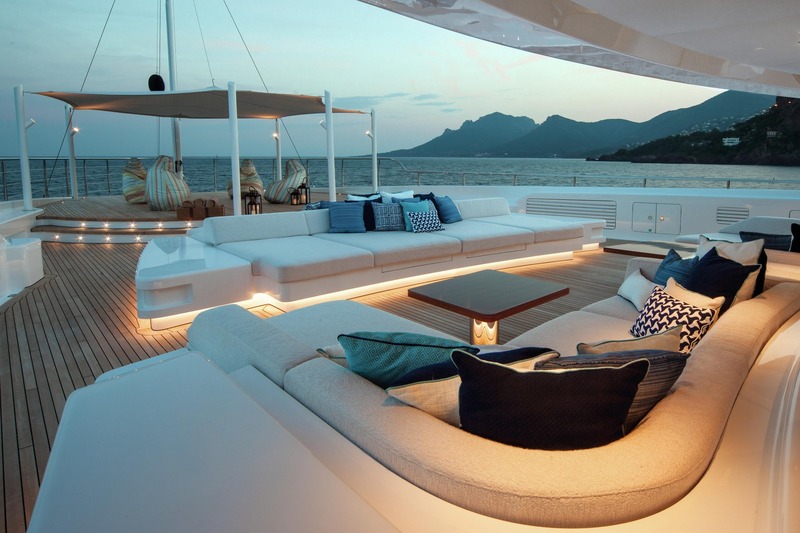 White and cream coloured theme with highlights of blues present the yacht in a true nautical style. 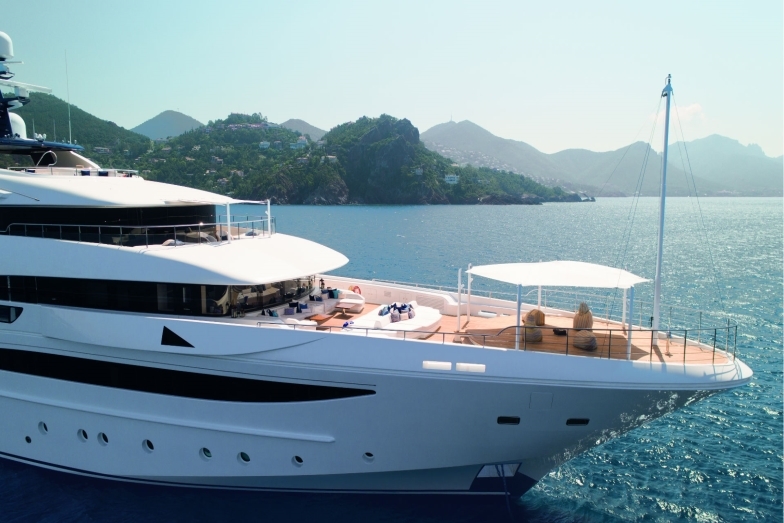 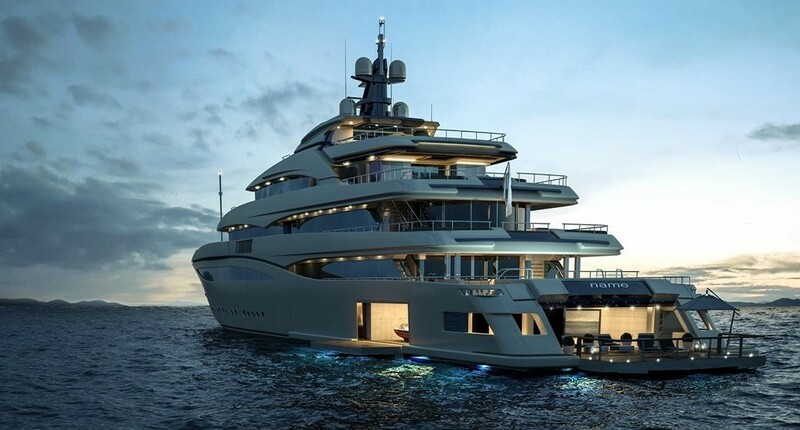 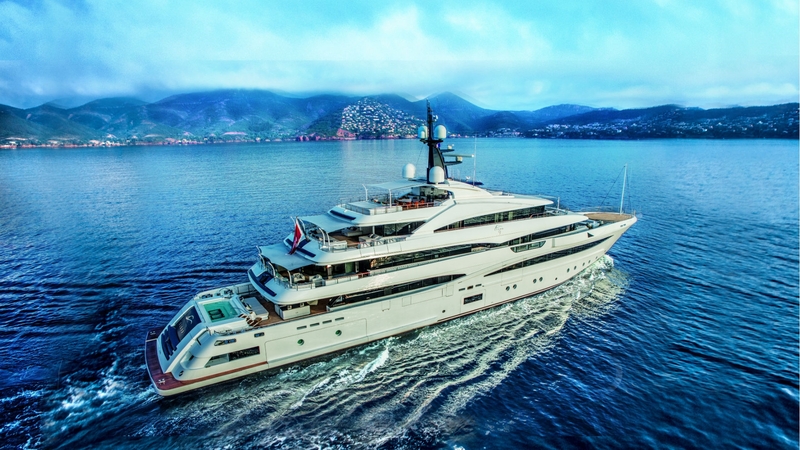 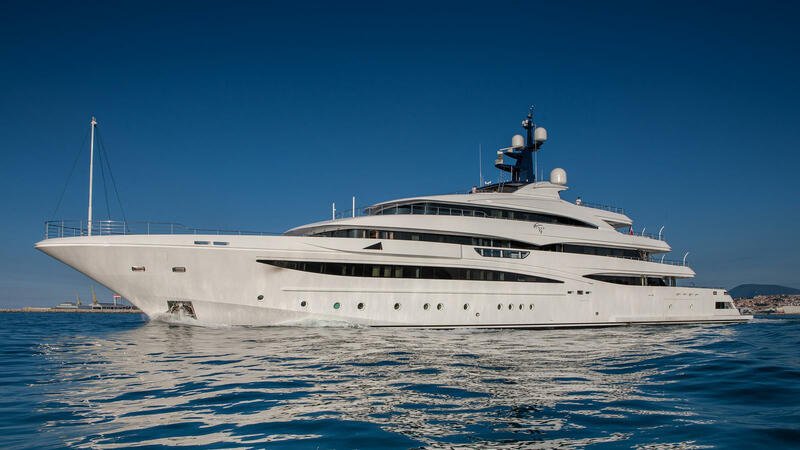 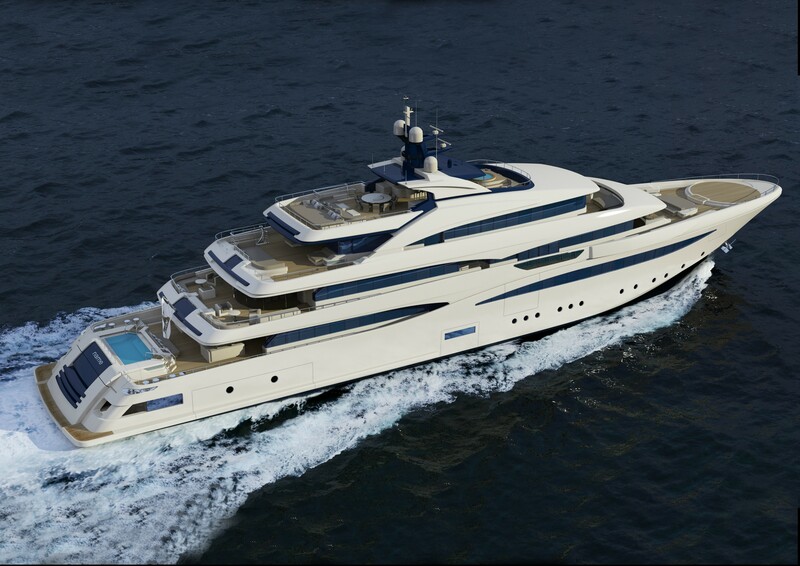 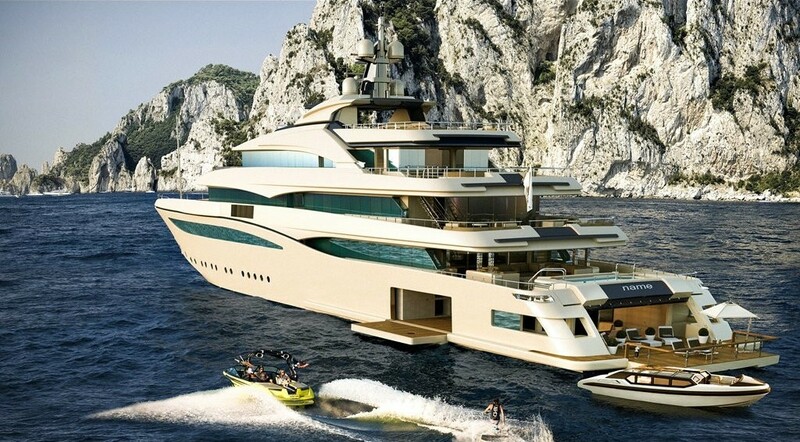 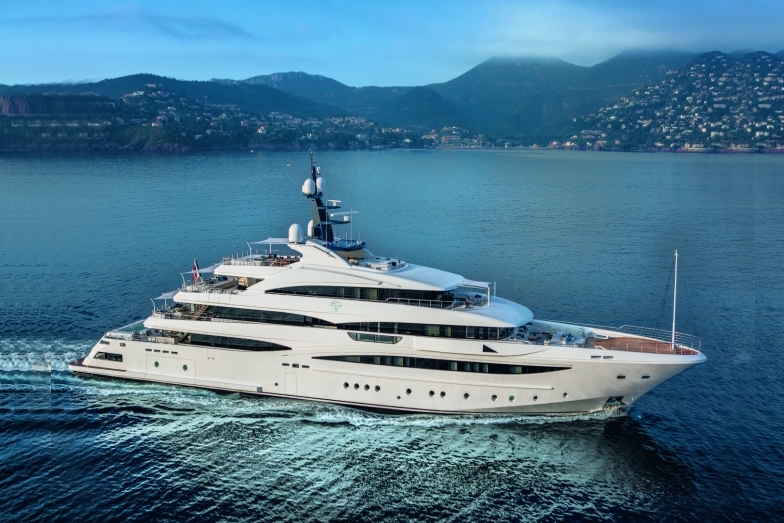 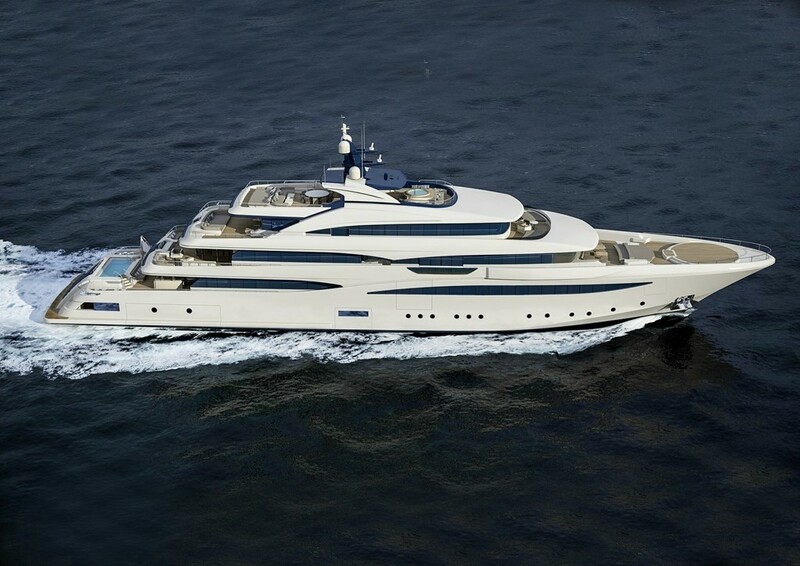 Some of the most important features of this exceptional 74m CRN include the spa area with a hair saloon and massage area, boasting a fold out balcony. 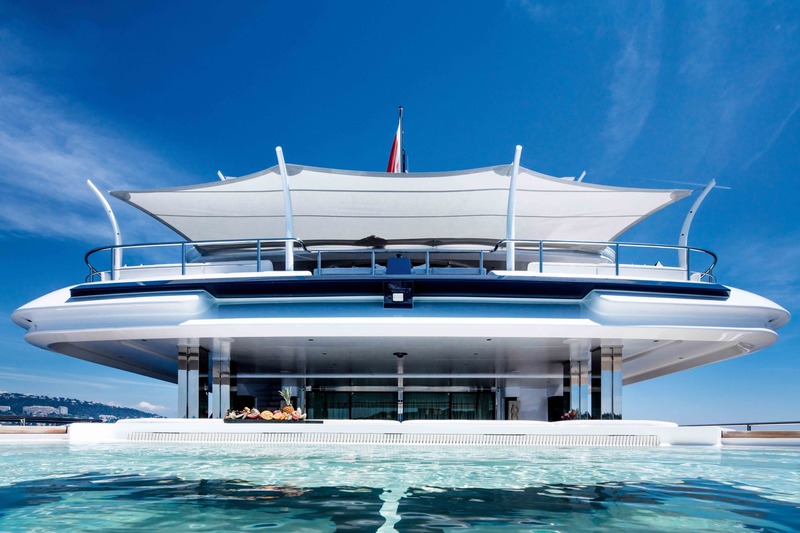 The fully-equipped gymnasium with spinning bikes, rowing machine, treadmill and kinesis machine, will please those wishing to stay fit all year round, while the beach club equipped with an Espresso bar offers plenty of entertainment possibilities for all ages and tastes: you can either just relax here with a cocktail in hand, dip your feet into the water or fully immerse yourself into the endless fun trying out the extensive selection of water toys found aboard. 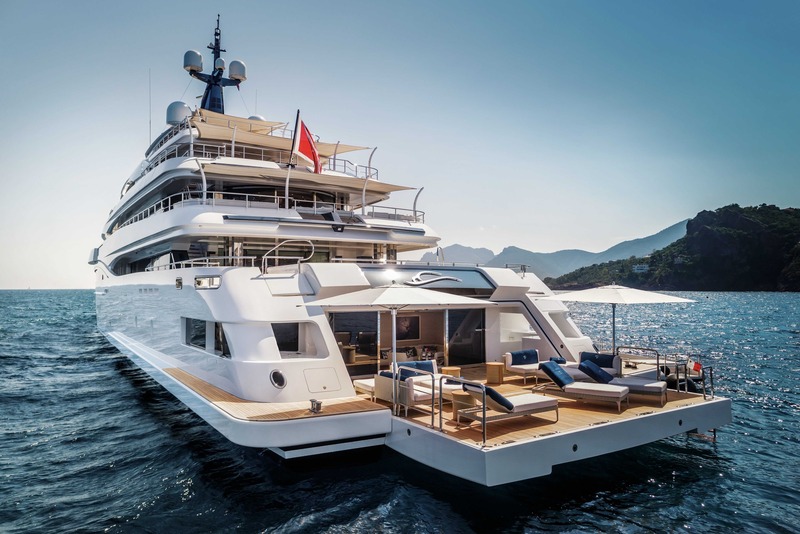 The main deck also features the very popular pool with spa jets, while a more relaxing Jacuzzi has been placed on the sun deck, surrounded by sun loungers with a teppanyaki bar and al fresco dining possibility further aft. 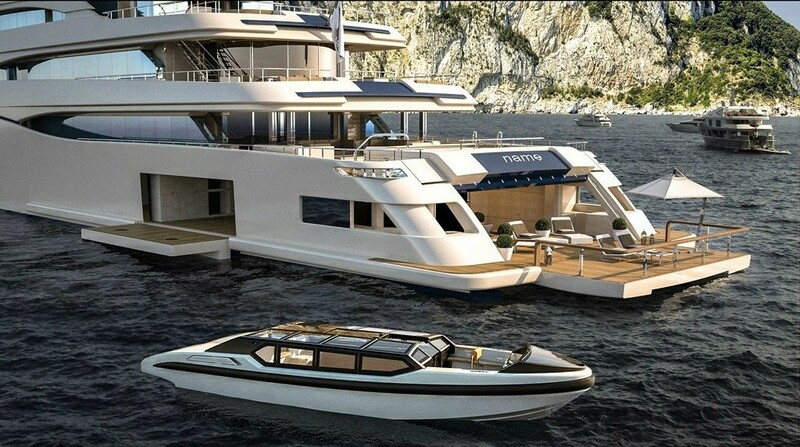 For those feeling like a great movie, there are two cinemas: one outdoors and one indoors. 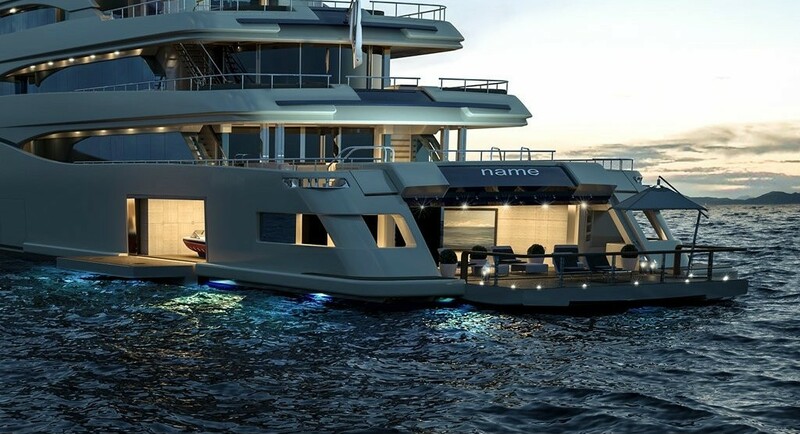 An elevator connects all decks from the lower lever up to the owner's deck. 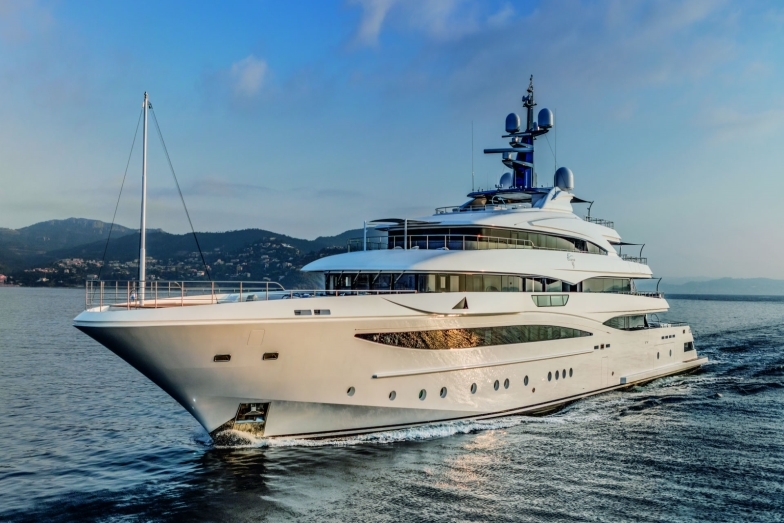 She is powered by two Caterpillar Diesel engines of 2,682hp each, reaching a top speed of 16.5 knots and a range of 6000 nautical miles at 12 knots, with a fuel consumption of 480 litres per hour. 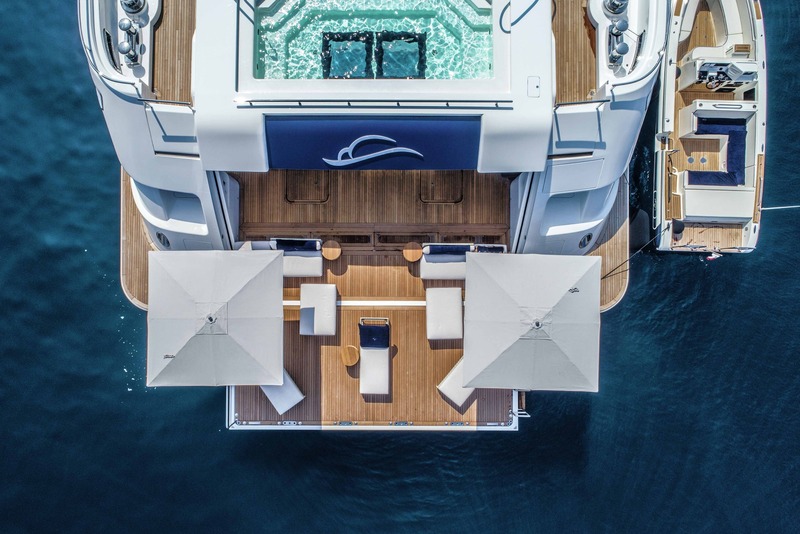 There are eight cabins on board, including six doubles with king sized beds and two convertibles, providing overnight accommodation for up to twelve guests. 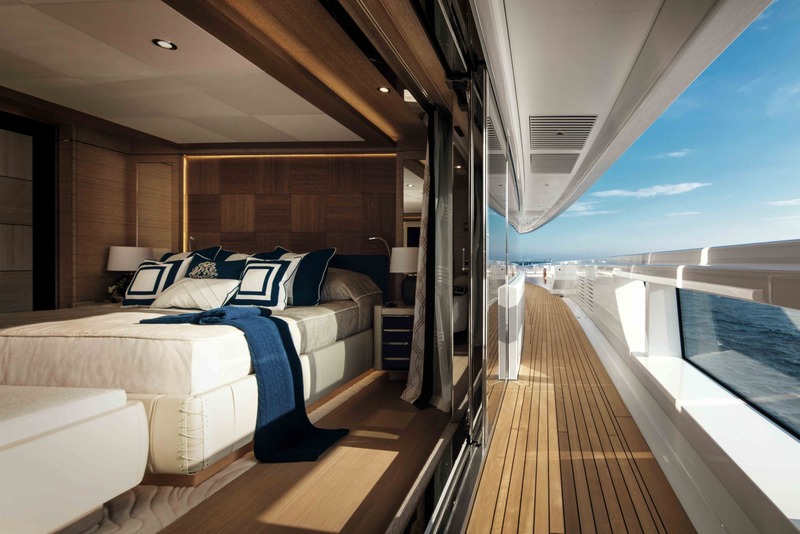 The owner’s deck features the master suite with a large king-sized bed, his and hers bathrooms as well as a spacious dressing room. 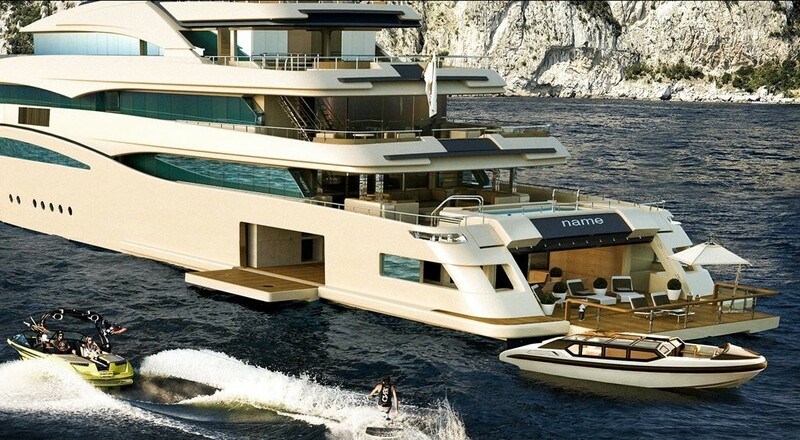 Forward there is a private deck area completely to the Owner’s disposal. 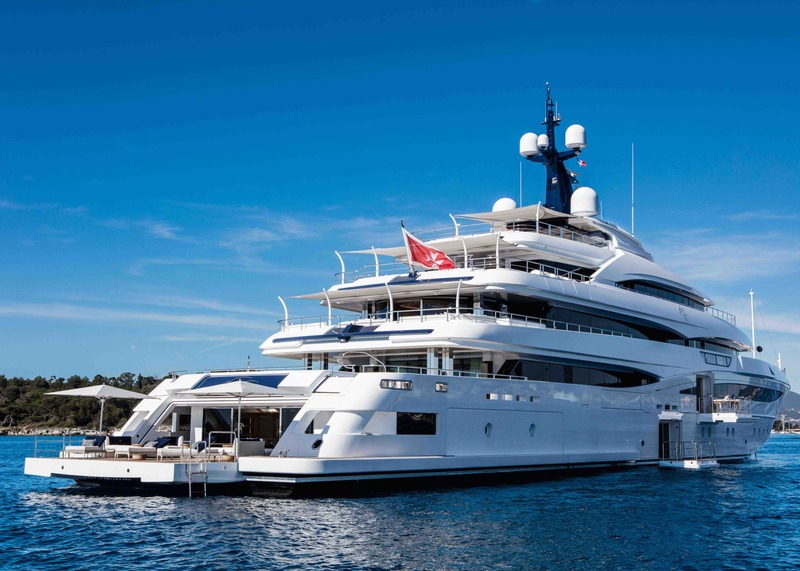 The upper deck is the home to a VIP cabin with a king-sized bed and an en suite bathroom with a bath and shower. 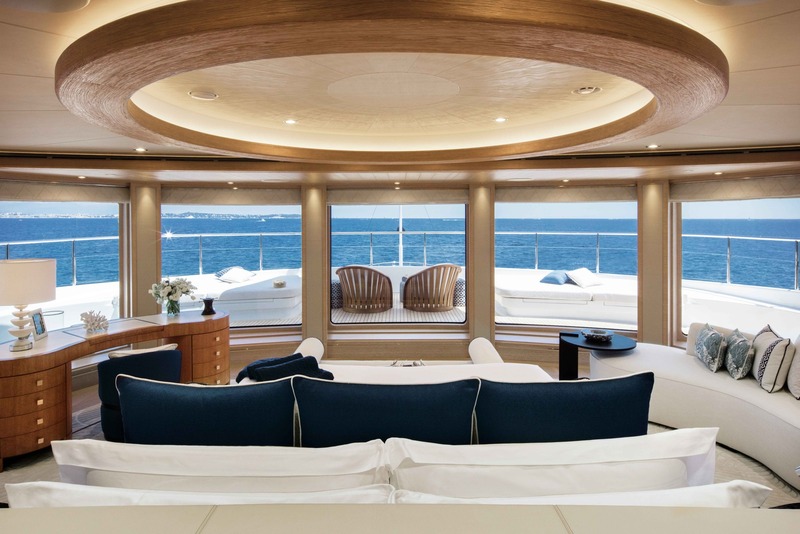 The main feature of this stateroom are the doors that open up to enjoy a fresh breeze. 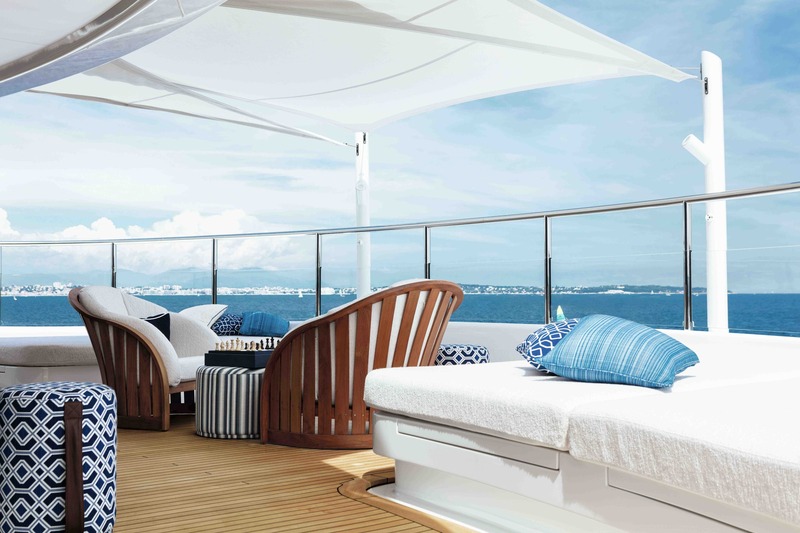 Further down, on the main deck we have the remainder of the guest cabins. 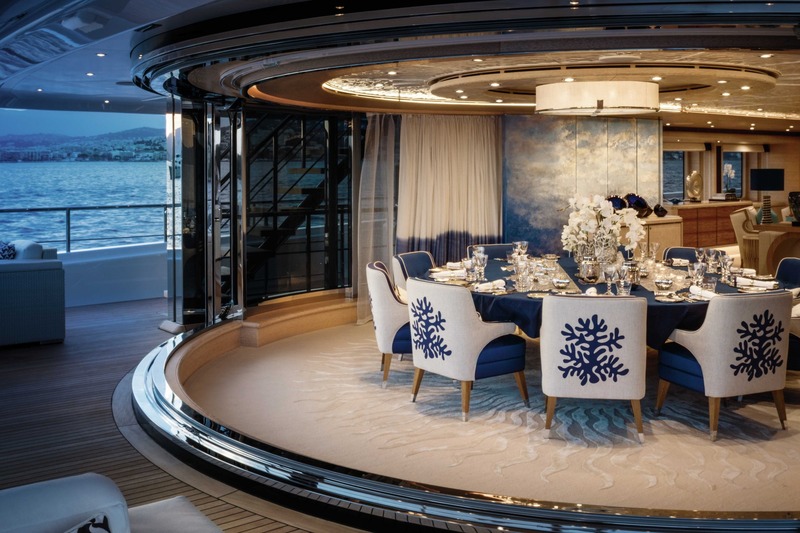 There are four king-bedded staterooms, two of which are convertible from twins to doubles and vice versa. 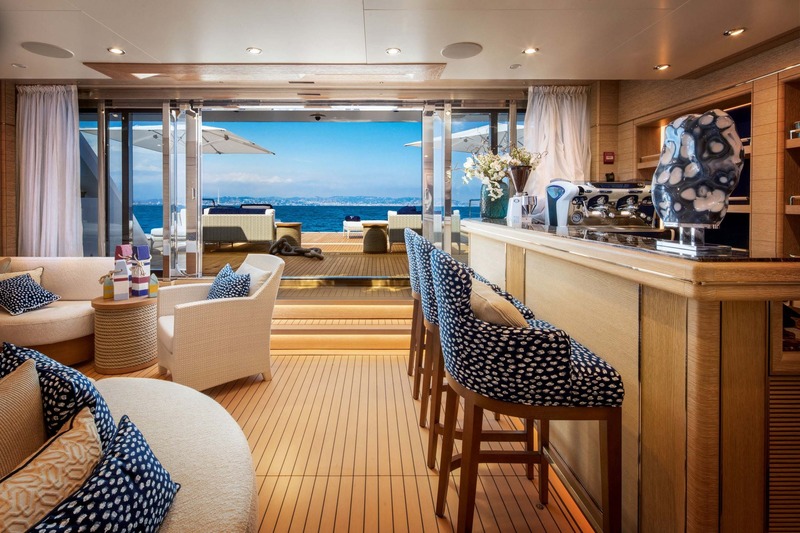 All cabins are fitted with en suite bathrooms with a bath and shower.